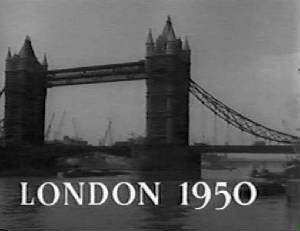 Distributed by: Television Programs of America, Inc.
in association with Incorporated Television Programme Company, Ltd.
"Made on Location in England"
On June 5, 1950, Dr. Alfred Holmes meets with Margaret Holmes at his London office. He tells her that he will see her again in one month, on July 5. As she leaves the office and hails a taxi, Margaret is struck by a passing truck. Seven years later, Margaret walks along a London thoroughfare and is momentarily stunned by the sound of screeching tires signaling a near accident. Speaking with a nearby doorman, Miss Holmes wonders aloud how she could have reached her present location as she was just hailing a cab at another part of town. Asking the name of the hotel, the doorman tells Margaret that it is the Westfield, to which she replies that there is no such hotel. The doorman informs her that the hotel has been open for four years. Asking the date, Miss Holmes is told it is June 5, 1957. She is stunned to learn that she has lost seven years of her life. 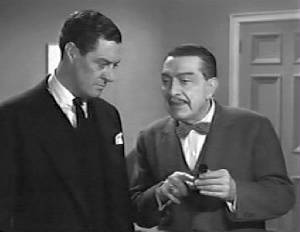 Travel agent Richard Stanton is on the telephone seeking the whereabouts of his assistant, a woman named Ann Meadows, as Charlie Chan, who is in his office seeking to learn why he has not yet received his airline ticket for a Paris flight that evening, overhears. Stanton explains to Chan that Miss Meadows was supposed to have delivered the detective's ticket the day before to the Westfield Hotel where he is staying. She was also supposed to have made a bank deposit, but she has not been heard from since the previous day. As Chan suggests that Miss Meadows may have decided to use the tickets herself as well as the deposit money to enjoy Paris, Stanton explains that she and he are engaged to be married. Suddenly, to Stanton's surprise, Ann Meadows enters the travel agency pushing a woman in a wheelchair. It is immediately obvious that she is unaware of her past as she tells how she found a purse with money with a deposit slip bearing the travel agency's address as well as an airline ticket for a Charlie Chan. When Stanton asks Ann what is wrong, she tells him that her name is Mrs. Anthony Holmes. As Stanton tells Ann that they have known each other for three years, the lady in the wheelchair asks if she can speak with him in his private office as Chan accompanies them. The woman, Cecilia Holmes, explains that Margaret is her sister-in-law and that she was married to her brother, Anthony. She had suffered amnesia for seven years, beginning on the day her brother died, but had now suddenly regained her memory. Margaret had been in a sanitarium for four years, but had disappeared for three years, coinciding with the time she had known Richard Stanton as Ann Meadows. Cecilia recalls that Ann Meadows was the name that Margaret had given one of her dolls as a child. Cecilia explains to Stanton that, as Margaret has no recollection of anything that has transpired over the past seven years, including her relationship with Stanton, and that it would be best to allow her to gradually catch up with all the memories that she has lost. When Chan asks Cecilia if her instructions are based on medical advice, she suggests that the detective to contact Dr. Alfred Black should he have any questions. As she leaves, Cecilia asks Stanton not to discuss the matter with anyone. At Dr. Black's office, Chan learns that Ann’s late husband, Anthony Holmes, was something of a "wild character." He would see other women and cared little about the well-being of others. In fact, his reckless driving had resulted in a 1948 car crash that had left his sister, Cecilia, paralyzed. Just before she had lost her memory seven years before, Ann had express her plans to divorce her husband, but she had learned from Dr. Black that she was going to have a baby. However, she lost the baby, as well as her husband, the same night she lost her memory. The doctor explains the series of events that had occurred that evening, including the accident involving the truck outside his office in which six pedestrians were seriously injured. Margaret was not seriously injured, so Dr. Black had contacted her husband who came to take her away after he was informed that his wife was going to have a child. Chan asks the doctor if it was the accident outside his office seven years before that caused Margaret’s amnesia, to which he states her amnesia set in later when Holmes, driving her home, was killed in a car crash. When Chan suggests that Holmes had been killed as a result of his wild driving, the doctor notes that Margaret's husband was dead before the crash, having been poisoned, presumably by his wife according to police findings. Dr. Black explains that Margaret's sister-in-law, Cecilia, requires a strong medication to ease her chronic pain. However, if too much is used, death will result. This was the drug that had killed Mr. Holmes with the bottle having been found in his wife's purse. However, as Margaret was suffering from amnesia and the police were unable to pursue a conviction, she was placed in an institution where she resided until her escape four years later, living for three years as Ann Meadows. The doctor adds that with Margaret's memory restored, the police will probably press the murder charge. Later, Cecilia tells Chan that it will only be a matter of time before the police arrest Margaret on the old murder charge, and she is worried that there has not been enough time to prepare her as she is yet unaware that she lost her baby seven years before and that she has a murder charge hanging over her. Chan suggests that Margaret must have remembered killing her husband as his death was planned and carried out before the car crash, and if she had lost her memory before the car crash, her husband would have been a stranger to Margaret and there would have been no reason for murder. Cecilia tells Chan that her brother was bad, hurting everyone around him including her private nurse, Joyce Gibbs, who had been having an affair with him at the time. Margaret had found out about the affair after finding one of Joyce's love letters to her husband, and Cecilia had fired the nurse as a result. Chan, asking how Margaret was able to obtain Cecilia's pills informs him that Joyce had a supply in her possession and had probably left them in a spot where Margaret found them. As he leaves, Chan suggests that it seems many people had a motive to kill Mr. Holmes. 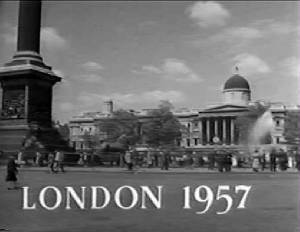 Next, Chan meets with his old friend, Inspector Duff of Scotland Yard and presents the police record of the accident in which Margaret Holmes was injured in front of Dr. Black's office seven years before. Strangely, while Mrs. Holmes' name is not present the name Ann Meadows appears, proving that Margaret had lost her memory a full two hours before her husband's death. A shaken Richard Stanton reaches Chan by telephone, informing him that upon arriving at his flat he heard a gunshot. He was then attacked by the shooter and was thus unable to see who it was. When he came to, he found Margaret Holmes lying on the floor, apparently shot. With Chan and Inspector Duff present, it turns out that Margaret had not been shot, but fainted. Chan surmises that the killer, interrupted by the arrival of Stanton, had missed the shot directed at Margaret, although thinking her dead, and escaping after slugging Stanton. Finding Stanton's keys on the floor, Chan asks if Margaret had been given a key to his apartment. Stanton, saying she had no key, tells the detective how he had met her three years before at this apartment when she arrived in a confused state of mind. Awakening, Margaret tells how she came to the apartment. Finding the door ajar she entered, seeing a gun pointing at her. The reason given for coming to the apartment was to see Nurse Gibbs. Duff informs her that the person who tried to kill her was trying to silence her regarding the murder of her husband, Anthony. News of her husband's death comes as a shock to Margaret. Cecilia suddenly wheels into the room, stating that she had come to the apartment upon finding a note from Margaret stating that she was going to clear up a matter with Joyce Gibbs, who, it turns out, had lived in that same apartment seven years before. As Margaret tells how she vaguely recalls having been to the apartment before, Chan suggests that it was possible that she was with her husband who may have come to the apartment to break off the affair with Joyce just before he was killed, and this memory was locked in Margaret’s subconscious. Chan is puzzled, however, how the missing Nurse Gibbs could have known that Margaret was coming to the apartment. He asks Cecilia if she had shared the contents of Margaret's note with anyone. Cecilia reveals that she had read it to Dr. Black. Visiting Dr. Black's office, he interviews the current nurse, Mildred Baker, who one knew Nurse Gibbs. However, she tells him that she has not seen Joyce for years. Back at Stanton’s flat, Margaret describes how her memory seems to return and recede at times. Suddenly, the sound of screeching car tires outside signal a near accident. This event seems to have brought about a change in Margaret's demeanor as she begins to respond as memories begin to return to her. Margaret vaguely recalls Nurse Gibbs being in the room with and Anthony her as he ended the affair, mentioning that Margaret was going to have a baby. Margaret was beginning to remember. At Dr. Black's office, Chan resumes his questioning of Nurse Baker. Inspector Duff arrives with news that he has found that Nurse Gibbs was not present the night that Anthony Holmes was killed. After she was let go by Cecilia, she had taken a new job in another city with records showing that she had been on duty on the night of Holmes' death, thus corroborating Nurse Baker’s story. Chan then tells Dr. Black that he needs to see the pills that he prescribed to Cecilia. Black then asks Nurse Baker to use her keys to open the storage closet door. As she pulls out her set of keys, Chan stops her and uses her key to open the door himself. Holding the set of keys, Chan notes one particular key in the set, a key matching that to Richard Stanton's flat. Chan notes that a seven-year-old telephone directory proves that Joyce Gibbs and Mildred Baker had shared that same flat. Mildred had kept her key and thus had access to the apartment. Chan reveals that it was Mildred Baker who had tried earlier to kill Margaret, and it was also Mildred who killed Anthony Holmes seven years before, using the pills left behind by Nurse Gibbs and then planting the bottle containing the remaining pills into Margaret's purse. Chan adds that it was actually Nurse Baker who was having the affair with Anthony and it was she who had written the love notes using Joyce’s name. Mildred then lunges for a bottle of sulfuric acid, intending to throw the contents on Chan, but the detective quickly stops her, grabbing the bottle from her hand. The next day, Chan stops by Stanton's travel agency to pick up his airline ticket. He finds Richard and Margaret who are just about to leave for the Registry office to be married. Tower Bridge – Completed in 1894, this iconic bridge crosses the Thames River and consists of two towers connected by two walkways located above a traffic span which is raised to accommodate river traffic. Trafalgar Square – Located in front of London's National Gallery, Trafalgar Square is named after the famous Battle of Trafalgar in which the British naval forces scored a major victory over France and Spain during the Napoleonic Wars in 1805. At its center stands Nelson's Column which is flanked by four guardian lions. Ann Meadows (to Doorman): "What date is it?" Doorman (to Ann Meadows): "June the 5th, 1957." Memory can often play very queer tricks.